I’m back in one piece, tired, and starving the moment I wake up (damn jet lag)! I took a bunch of photos. Want to see? 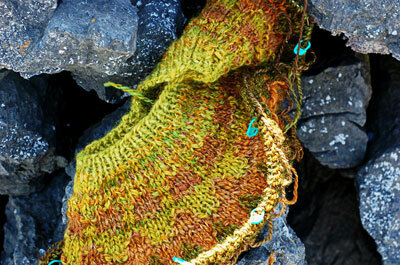 I knit like a maniac on the way over, and then knit quite a bit on the beach on Inis MÃ³r, the largest of the Aran Islands, but woe is me, didn’t even pay attention to what I was doing, so at some point after that photo was taken, I cocked things up badly and there’s a lot of ripping for me to do. Just so’s you know, I was allowed to attempt (I love it) to get needles on the plane coming back, but I didn’t chance it since bags are searched at least twice and no one at the first two stops could tell me if the third would allow the needles through. I don’t think they would have, as they searched through everything like maniacs, even digging into change purses and the like. The EU doesn’t seem to have a written policy on knitting needles like the TSA does (they’re allowed). The little dental floss container cut my yarn nicely, so thanks for that tip! I can’t tell why you need to rip, but the colors are gorgeous together and the whole effect is fabulous. Dude. love the colors. You phots are great, Ireland looks fantastic! The pictures are gorgeous! And I’m so glad I’m not the only person who takes pictures of my meals on vacation. :) Looks like a great trip! Love the colours of that sweater. Hope you had a great time in Ireland. Sigh. So beautiful! Now I want to go. I wish I had some relatives left to visit, but I think we all left during the potato famine. Sorry about the Bohus woes! I’m very eager to see you get started again properly. I think this one is going to be an incredible sweater. The pictures are beautiful, and that sweater is amazing. Welcome back! Lovely pictures, lovely sweater! I carried 3 sets of bamboo dpns on the plane to and from Sweden in the past couple weeks and no one said anything. But then again there was minimal searching through bags, so it may have just been luck. Frankly, I like to think that it wasn’t luck but rather that the security guards also suffer from a bit of knit-itis and know that 9-hours sans knitting would give anyone the shakes. welcome back! I have enjoyed seeing your pix. looks like a lovely relaxing vacation! Only place I’ve ever had my needles confiscated was Poland. I, too, have had great success with the dental floss as yarn cutter. Stunning photographs, only makes me what to go there even more. You must have had a wonderful time. Welcome back! And thank you for the wonderful photos. I love Ireland. It was the last country we visited with my parents and my sister all together when I was 13, and I was simply amazed by the versatility of light. You captured it we in your photos I think. I hope to go back there in a few years with my children. How awesome!!!!! I would love to own the dilapidated cottage. It all looks so great. Ooh, your pictures are awesome! I wanna go to Ireland. How beautiful! Exquisite use of color! Just gorgeous. Can’t wait to see further progress.